Or would it be imperfectly perfect? It’s a snowy and grey beginning to December as I begin writing this, and it definitely is a bit of a winter wonderland here the last couple days to help create the mood. Despite a Hallmark movie image and the grand plan in my head that nearly requires a spreadsheet to go with it, I personally have little – well, actually pretty much squat – done in the way of preparation. But thanks mainly to Facebook, I am keenly aware that several – it feels like all – of my friends are nearly or, indeed, already ready. Almost somewhat surprisingly to them. Like it happened overnight practically by accident. Or magic. And, of course, they certainly are not remotely apologetic about it. As tends to go the 80/20 rule, most of me is genuinely happy and maybe slightly in awe of them. But deep within burrows that little bit o’ me that just has to say – only to myself, obviously — “But of course you are.” Ready, that is. Complete with eye roll. Does it all set off the perfectionist in you, too? Who then twists that into even more pressure to get it all perfectly in place already in November, so that you can be effortlessly imperfect about it all in December and enjoy the holiday season to its fullest? When the goalposts seem to creep, and your boundaries along with them, how are we supposed to win at this? As He has for centuries, that Christ Child is acomin’, whether or not we splurge and max out our credit cards on new indoor and outdoor festive décor. (But those outdoor planter pots are beautiful, are they not?) Whether we channel our inner Martha Stewart and cook and bake the freezer full in preparation to host the masses. Whether we run around for hours on end in search of the perfect gift for every name on our list until we hate our fellow (wo)man. Whether we get super fancy AND recycle and upcycle while we wrap. AND clean the entire house top to bottom. 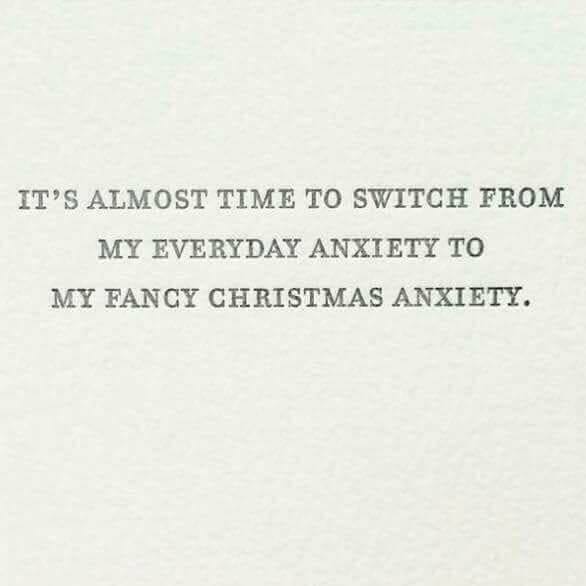 AND all the while maintain whatever eating program we’re currently on that so we don’t dare gain an ounce, so that we can’t even pickle ourselves in Bailey’s & coffee AND rum & eggnog just to make it through. AND — not to mention — all while juggling a job. Maybe even a business. The 25th will arrive whether or not you’ve ticked every last thing off your list. And before the Boxing Week sale signs finally come down, will it even matter? As much as we always want to have it all together, we admitted we really have very little control. For all the best-laid plans, Life will always happen. We chose our sanity and mental wellbeing above all else. We decided to be present in the moment. We surrendered. We let go and let… whomever or whatever you choose to believe in. We made an inventory of all OUR priorities based on OUR values. We gave ourselves permission to be a little bit selfish and tune everyone and everything else out. We chose to look inward for our own answers. We committed to really hearing our innate inner wisdom about what we want and need. We got really honest with ourselves about what’s working in our lives and what’s not. We chose to move mindfully towards where we want to be and how we want to feel. We were entirely ready to let go of our notion of the ideal, fairytale, traditional Walton family-style Christmas, just because it’s what everyone else does or it’s what we think we should want. We gave ourselves permission to do things our own way. We acknowledged who all around us we would positively affect and influence when we are in a better, authentic, more aligned place. We apologized to ourselves for having such wickedly high expectations and setting ourselves up to fail from the get-go. We also forgave ourselves for getting caught up and comparing ourselves to others in the first place. We continued to check in with ourselves and how we were feeling. When we experienced a backslide – and we realized that WE WILL backslide — we did our best not to judge ourselves. We acknowledged the lesson, reset and carried on as best we were able to. We set the intention of progress, not perfection. We asked our guardian angel to support and guide us to live in flow and ease. With grace. We stopped pushing, pulling, working, hustling, forcing, striving, rushing and trying to control everything from a place of near desperation. Having done our best to be THAT woman, we genuinely enjoyed Christmas on our own terms. And we used that experience to build on to create our best life, our very own happy ending.